There are a lot of memes out there, especially for BBC’s much-beloved Sherlock! For our last meme-history post of this year, we wanted to cover all of them. This is not all of them. But it is a big collection of bite-sized “mini-memes”. All the trends in Sherlock fanfiction and related media that people grabbed onto and ran with. Sometimes in some weird directions. What do you expect when a BBC Sherlock exploitable image lands on a photoshop subreddit? We’ll get to that. But let’s start with something that’s plagued fans of the BBC series and runs back more than a century. Why is John Always Depicted With a Mustache? This is a question from BBC fans in particular. Which is actually a rather odd phenomenon itself. Because the vast majority Sherlock Holmes adaptations feature Dr. Watson’s big, bristly mustache. So where’d the mustache come from? It’s canon. Arthur Conan Doyle described Watson thusly “Watson was a middle-sized, strongly built man, square jaw, thick neck, with a mustache” in his short story The Adventure of Charles Augustus Milverton. And almost every film adaptation has adhered to that, going back to the film adaptation with Nigel Bruce as Watson. That mustache was so iconic, it became almost impossible to think of him without it, especially in contrast to the usually clean-shaven or stubbly appearance given to Holmes (which we’ll talk more about in a second). Well, Martin Freeman ditched it. Given that Jude Law had just played that same role with, possibly, the greatest rendition of that mustache in Holmesian history, Freeman’s choice raised some questions. Those questions reappeared with force after Freeman entered with a fully grown mustache in Season 3 (only to be mocked by Holmes). The mustache is gone by the next episode. Now, Freeman has said that he doesn’t like that mustache, and the fact of the matter is that that style of ‘stache just isn’t contemporary anymore, so it would’ve been a hard sell in BBC Sherlock’s modern setting. But, there’s a bit more to Watson’s mustache than that. The fact is that Arthur Conan Doyle might not have been the one to come up with the mustache. Remember how we said Doyle described Watson in “The Adventure of Charles Augustus Milverton”? Well, that was the 34th Sherlock Holmes story, published in 1904 and taking place after Holmes’ final conflict with Moriarty. He still came up with it, right? Sir Arthur Conan Doyle assisted William Gillette in writing a Broadway production of Sherlock Holmes. This featured Bruce McRae as Dr. Watson, and he opted to give himself a mustache for the role. Thing is, this was in 1899, five years before the mustache made an appearance in the actual short stories. It’s absolutely possible McRae was the origin of Watson’s mustache! As for why he might have done so and why the trait stuck, the answer is simple: character design. As we said, Watson’s bristly mustache serves as a sharp contrast to Holmes’s clean-shaven or stubbly, unkempt appearance. Sherlock Holmes stories center around a “dynamic duo,” and it’s always wise to give them some characteristics that set them markedly apart from one another. One more thing before we move onto the next meme: give BBC some mad props for adding in Watson’s mustache as late as Season 3, after they deal with Moriarty. Because that lines up so perfectly with the mustache’s first appearance in the short stories. Oooh, we promised we’d get to you, reddit’ers! On January 16th, 2014, a Reddit user named Mikejohnno uploaded an image from BBC’s behind-the-scenes footage of the season three premiere to the r/photoshopbattles subreddit. 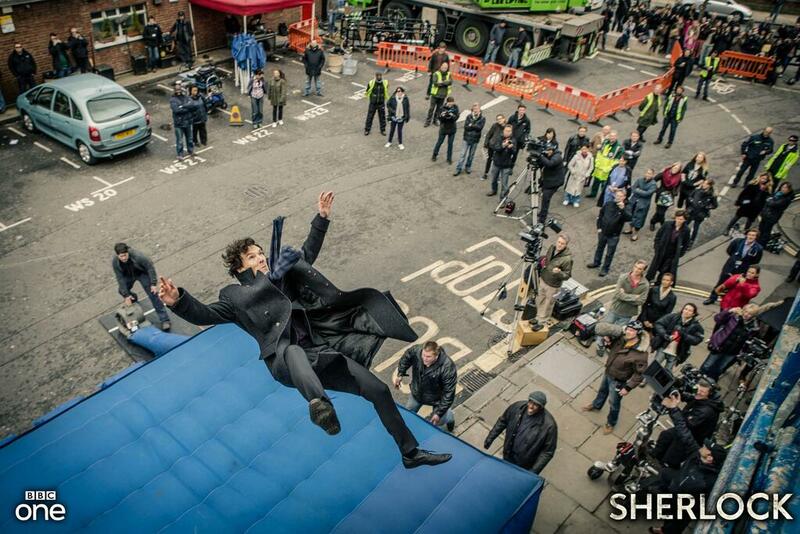 This image depicted Sherlock falling backwards into an air cushion. That image turned out to be an exploitable image. For those who don’t know what that means, it means that the image isn’t overly distinct and is easy to edit. With an exploitable image anyone with a will to do so can edit that image to depict…something else. Exploitable images are the bread-and-butter of the r/photoshopbattles subreddit, where users are given an image to photoshop, with the goal of seeing who can come up with the craziest, funniest, or downright most impressive edit. So now, to the Sherlock fandom’s delight, r/photoshopbattles had joined the fanart party. Dozens of submissions popped up in the first few hours. All of them followed the same format. They cut the image of Sherlock falling to his supposed death away from the background and plopped Cumberbatch… somewhere else. And the meme “Sherlock Falling on Things” was born, taking what was the most tragic moment of Season 2 and turning it into a farce. You’ll find images of Sherlock falling into anything, from punk rock shows to baseball games. Check out tsarmikhail’s wonderful series of these, including the original image. This is one of those memes that got big enough to go mainstream the next day. On January 17th, 2014 Jezebel.com posted an article filled with some of their favorite examples of the meme. The meme is sadly defunct now, but its absolute disregard for the solemnity of Sherlock’s fall lives on in our black hearts. Oooh, we’re always blown away by what fanfic writers dig up! As you know, us fanfic writers love going into territories left unexplored by our favorite fandoms. It’s really one of the best parts about fanfiction; seeing what other creative minds might do to adress the questions left unanswered. It’s no surprise that fanfiction writers delve into the futures of our favorite characters, all the way into parenthood. But why do we constantly name Sherlock’s son “Sherrinford?” Archive Of Our Own has ‘fics featuring a young “Sherrinford Holmes” as far back as 2012. But it goes back earlier than that. Then, season 4 names the facility they keep Eurus in Sherrinford (Edit provided by Tumblr user “gianish” – Thank you!). So you gotta know something is going on with that name. But, where did the name come from? Sherrinford was actually the original name Sir Arthur Conan Doyle had given to the character of Sherlock. Eventually, of course, Doyle decided to go with Sherlock, but the name of “Sherrinford” still appears numerous times in Doyle’s early notes for the series. Just his notes? But then how does everybody seem to know about it? William S. Baring-Gould is a Sherlock Holmes scholar who, as a part of having the most awesome job in the world, wrote the fictional biography “Sherlock Holmes of Baker Street.” In it, he proposes something interesting: in one story, Holmes states that his family were country squires, which means that the eldest brother would have to stay and manage the house. Given his residence in Baker Street, Holmes obviously can’t be the eldest. What’s more, Mycroft wouldn’t have had the flexibility to play the role he does in the short stories if he had to stay and watch the house. When you add in the fact that Mycroft’s position as a civil servant was extremely common among youngest sons of country squires, it begins to seem like there must be a third Holmes brother. Baring-Gould proposed that Sherrinford Holmes must be the oldest Holmes brother. As that biography became popular, the fan theory that was Sherrinford bloomed. And given that any fan passionate enough to write their own ‘fics is probably well-read in other aspects of the character’s history, it’s no surprise that they would decide to name Sherlock’s son after his oldest brother. That said, some writers do throw Sherrinford in as the oldest brother… and sometimes the youngest. The trend is flexible, and ‘fic writers use it to its fullest. What’s Up with the Alias “Sigerson” Holmes? Have you ever noticed how often writers go with “Sigerson” when Sherlock needs an alias? There are two parts to this story. The first part goes all the way back to 1903, with the publication of “The Adventure of the Empty House.” Let’s put that in some historical context – Arthur Conan Doyle had killed off Sherlock Holmes a few years prior and had faced a massive amount of public pressure (you can read about that in our earlier post on the I Believe in Sherlock Holmes meme!). Huh. That’s a nice name. Wait, didn’t we say there were two parts to this? This film brought the name back into vogue and Sherlock fans knew exactly what it was calling back to. As such, the film served to seal “Sigerson” as a name to remember and usually, of course, as Sherlock Holmes’ default alias. But it’s all the ones we have time for this year. We’ve had a ball digging deep into the memes and trends in the Sherlock fan community. Hopefully, you’ve gotten all of the answers to your questions and learned a bit about the history of Sherlock Holmes besides.